I'll outright say it: there are hundreds if not thousands of other music blogs out there that will better serve your techno and dance music desires. I like lots of techno and electronic music as much as other genres, but as a single and club-based medium, I'm definitely not the guy who is going to turn you onto the new big thing. When it comes to modern stuff, I just listen to critics and some fans, get what they tell me to and assume it's going to be good. Oftentimes, it isn't. It has kept my techno and house collection fairly modest. After trying my hand at the ever-growing current minimal scene, I've discovered that much of it isn't for me. 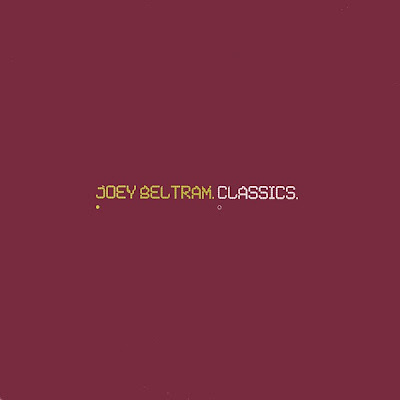 However in that revelation, I've finally turned my attention to some of the pioneers of the dance genres, Joey Beltram (under his numerous guises) being one of them. Classics collects 13 (classic) dance cuts from the New York based artist. Even the uninitiated techno fan has probably heard tracks like "Energy Flash" and "My Sound" but as the compilation title tells us...these are not just run of the mill compositions. I can't tell you about Beltram's influence on any scene. I can't recollect any sort of memory of seeing the guy live. I can't tell you about the effect his tracks have in dance clubs. I can tell you that right now, July 27, this compilation is hitting me hard all over again. When the music is this good, this..."classic"...you don't have to find yourself in the club to enjoy it.